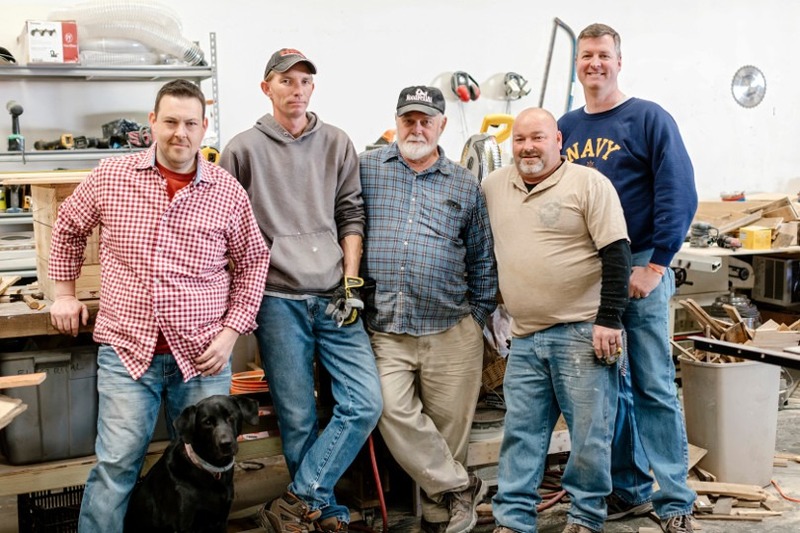 The Woodfellas are your go-to guys for professionally built, quality rustic home furnishings. Whether you want something made from salvaged wood, something new, or something new that looks old, we’d love to build it for you. Each piece of WoodFellas furniture is lovingly handcrafted by one of our professional woodworkers. We specialize in rustic, handmade, farm house style furniture. Do you need a table, bench, barn doors, built-ins? We can build it for you. Our salvaged wood walls enhance any room. With a virtually unlimited choice in finishes we guarantee your wall will be unique and your guests will love the final outcome. Do it yourself but not by yourself. Join us at one of our weekend workshops. Have fun with your friends and make some new ones as you learn by building your very own wood item, with our help of course. We love to reuse or repurpose old wood. Whether it comes from old barns, wood floors, or pallets, we enjoy making old wood new again. Woodfellas is here to help you beautify your home with rustic wood walls, furniture and fixtures. We’re committed to providing high-quality products and unparalleled customer service. Make us your go to source for rustic wood walls, furniture and fixtures in Hampton Roads. “They did a gorgeous pallet wall in our half bath. We absolutely love it! So much so that we decided to get a head board made. Definitely recommend WoodFellas!” – Haley B. “What an amazing group of people.. I had the best time at the Mermaid Workshop. They do so many things with salvaged wood, new wood, and total out of the box thinking. If you can think or it or find it on Pinterest they can make it.. best of luck in the future of this business.” – Elizabeth R.
“I cannot recommend this place enough! We attended one of their workshops and was pleasantly surprised at the down home, feel good environment they provide! They were overly compensating and beyond available for all our questions and needs. You will not regret your experience! Thank you to every single one of you!” – April B. “They came out and did an accent wall for us in our foyer. It looks amazing. Everyone comments about it. They are very professional and polite. They clean up after themselves. Stayed true to the estimate.” – Thomas B. “These guys are awesome! Very friendly and helpful ! Built me a custom fireplace mantel that looks perfect ! Thank you !” – Art G.
“I had a very good experience with Beau and his team. I loved the overall look of a pallet wall but I didn’t want the rustic feel to it. Beau understood and help make it modern for me. He built the mantle and installed the fireplace as well. It was a pleasure working with him. I look forward to collaborating on many more projects.” -Tee G.
Did you ever see something on the internet and though to yourself that you just had to have it? We custom build things for people all the time. We can re-create just about anything made from wood. Call us for a free estimate and let’s work together to make sure you get what you want.